Welcome to Himalayan Trekking and Tours company - A leading tour operator based in Kathmandu Nepal. Since our inception in 2003, we have are pioneer in arranging the adventure tours in the Himalayan countries - Nepal, Tibet & Bhutan. Book any tours with us. We assure you for the flawless trip! 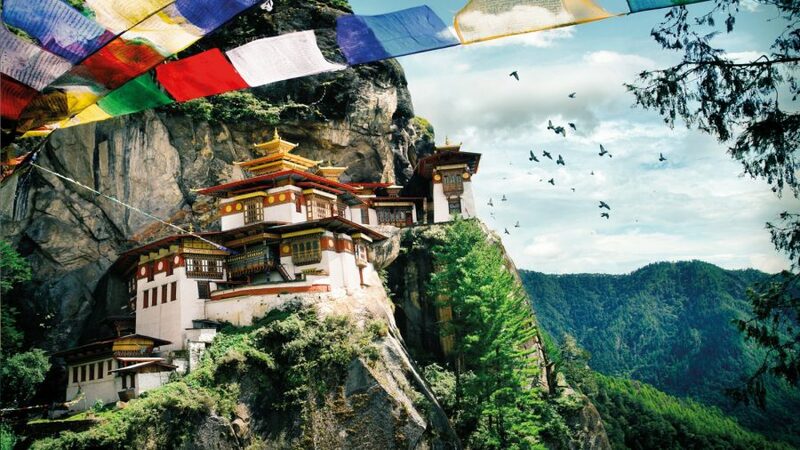 We offer outdoor adventure trips into three very different cultures that include Nepal, Bhutan and Tibet. We provide you with trips that include peak climbing, mountaineering, rafting, mountain biking as well as wildlife safaris. also providing cultural tours as well. We will be happy to develop a custom tour that will meet all of the requests of our clients. We can mix or match activities as needed to exceed your expectations during your time with our friendly and experienced guides. We can also address any special physical or dining requirements. Think of us when planning your honeymoon, or photography adventures. Our team is a group of experts who have academic and technical expertise in the tourism industry and our company has got a collective experience of more than a decade. Our loyal, committed and experienced staff gives us the edge over our competition. Our motto “Safety, comfort and standard service in the price you can afford” reflects the wide range of services we provide to our valued customers. Our Tour leaders and guide who are a specialist in religion, culture, and tradition in this region has helped a lot to establish our company as the leading trek organizers in the region in a short span of time. We are committed to provide personalized services to our clients even before they leave home and until they are back home sound and safe. Our team provides sound knowledge of health issues, trek preparations, visa and other frontier formalities and other many issues related to travelling. If you have a passion for travel and want to experience the ultimate adventure in Himalayan region (Nepal, Tibet, Bhutan & India), then you can entrust us. With the better understanding of your desire to visit new places and come home with a real sense of satisfaction, we have the potential to turn your dream adventure trip into a reality while taking care of your interest. We offer a commitment to quality in all aspects of the products and services we provide and represent to you. Himalayantrekking.com is able to set up travelers and trekkers in standard lodges, resorts, airlines and other tourism related industry around Nepal. Our professional team constantly monitors our range of tourism related industry to make sure that we offer the highest quality with comfort. We guarantee the our clients receive services in the most accurate and whenever you need a quick answers to your inquirie and rapid confirmation of your booking request. Our experts will manage everything so that you can just relax and enjoy your fruitful holiday. Himalaya trekking is a travel and tour company located in Nepal. Our travel and tour company is affiliated by Ministry of Tourism Nepal, Govt of Nepala, Nepal Tourism Board (NTB), Nepal Mountaineering Association (NMA), Trekking Agencies Association of Nepal (TAAN)). These affiliations make us more responsible towards our guests and hearten to provide you with our prompt services. With our members having more than 12 years of experience in the travel and tourism field, we can safely say that we have faced and solved almost any kind of problem that this field may throw at us. We not only carry out the services of your choice, but also provide suggestions as per your interest and inclination. Himalayantrekking.com offers 24 hours services to our clients. We are 100% company owned and operated by Local, full service, emergency service provides 24 hours per day. You can call us at any time as per your convenience on the number given in our website. Also, you can drop us an email related to your queries so that our executives can get back to you with the solution to your queries at the earliest. We organize small group adventure treks and tours to those looking for group tours and we listen to every members of the group so, you feel that you are in family and we at HimalayanTrekking.com offers personalized tour itineraries and departures for families, couples, group of friends and students to those who wish to have private tours. Your safety is of the utmost importance to us. Thus, we focuses on the safety of the travelers and trekkers who are with our company. Our selected guides are technical proficiency, well knowledgeable with proven safety and well known about the trekking and tour routes. They are also highly professional and well trained in first aid and personal protection equipment. We also make sure that first aid kits are available on all trips and happily provide oxygen cylinders.Furthermore, the itineraries are ideally designed to give you enough time for acclimatization. Tailor-made tours offer you the flexibility to choose your own path. Our itineraries are flexible as per your choice. So that, you get to travel and trek in as many activities and locations as possible, or incorporate some relaxation and free time to explore on your own terms. Our professional team of guide will recommend you to choose the best tailored trip as per your desire. Always believe in customizing every trips with the potentials for extraordinary moments, linked by smooth logistics and 24/7 emergency support from your front door to Nepal, and home again.